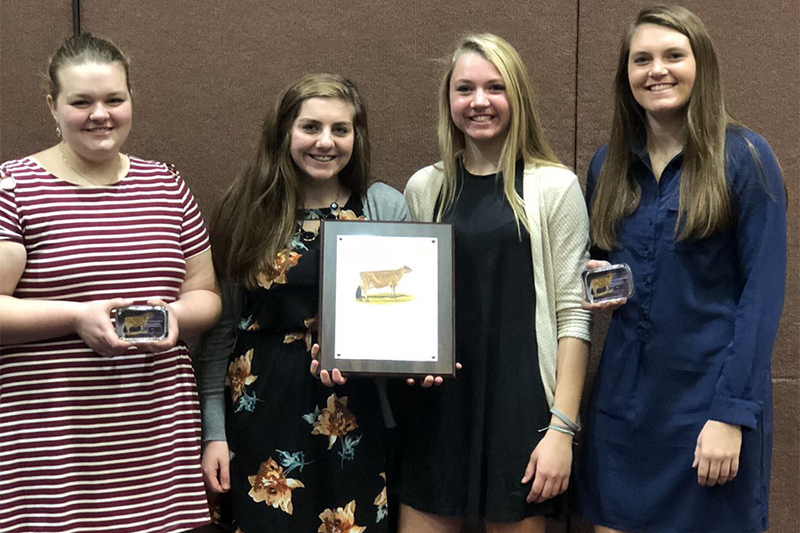 When given their award for high team in Jerseys, Madi Palmer (10), Amber Engelken (11), Laney Demmer (10), and Tehya Demmer (12), pose for a picture with their plaques. The girls worked as a group of four during the competition. Laney Demmer (10) and Tehya Demmer (12) traveled to Louisville, Kentucky, to the North American International Livestock Exposition (NAILE) for a dairy judging competition November 4-5. The two Demmer sisters competed in groups of four with Amber Engelken and Madi Palmer. Ten sets of four cows were brought out at a time, and their group had to judge the cows based on their appearance. Then, after the judging, they had to explain their reasonings to the final judges. The following day, the judges gave awards based off of the group’s judging comments. The girls earned first place as a team in Jersey cows. The competition consisted of 22 youth teams and 16 college teams.